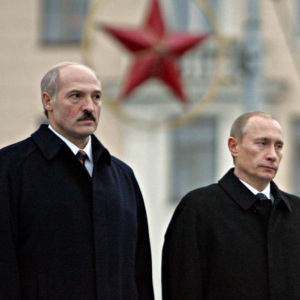 BelarusDigest > All > Will the Kremlin topple Lukashenka? Recently, rhetoric surrounding Russian-Belarusian relations has become so sharp that some journalists and analysts believe the Kremlin plans to overthrow Aliaksandr Lukashenka or occupy Belarus. However, off and on conflict remains a fixture of Belarusian-Russian relations. Despite belligerent grumbling, Lukashenka mostly upholds the Kremlin's interests, promoting cooperation between the two countries. 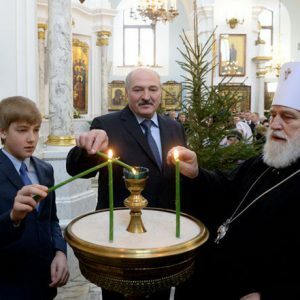 Would the Kremlin replace Lukashenka and occupy Belarus? In recent months, people of different political views and backgrounds have begun to voice concerns that the Kremlin plans to replace Lukashenka. On 4 January, the chief editor of the Belarusian oppositional news source Charter 97 Natallia Radzina stated that 'Russia is currently conducting an operation to depose Lukashenka.' Her colleague Dzmitry Bandarenka had spoken about the existence of documents that prove the existence of a plan to replace Lukashenka a few days earlier. Meanwhile, on 11 January analysts Arsen Sivitski and Yuri Tsarik, who have warmer attitudes towards the Belarusian authorities, published a report claiming that Russia is considering occupying Belarus. Their conclusion was based on information regarding the Russian Ministry of Defence's plans to send four thousand railway carriages to Belarus next year, which is 83 times more than in 2016. Although these two claims are coming from very different ideological backgrounds, both sides believe the Kremlin is angry because of Belarus's refusal to support the Kremlin's actions in Ukraine as well as its resistance towards the idea of a Russian base on its territory. Moreover, they believe the Kremlin is angry enough to attempt to get rid of Lukashenka. However, Russia has little chance of replacing the Belarusian president: unlike Ukraine, Belarus has stable public institutions. These speculations do indeed seem to hold water given the present condition of Belarusian-Russian relations. Lately, it seems that Belarus and Russia are butting heads on just about every issue. One month prior, on 26 December 2016, Lukashenka ignored the summit of the Eurasian Economic Union, where Union heads of state signed the Customs Code, which members had discussed for three years. Although the code was signed by all other members on 26 December, the president of Belarus only agreed to approve it two days later on condition of further negotiations. It is no secret that the Belarusian authorities are hindering the Eurasian integration project because of the oil and gas conflict between Minsk and Moscow, which has now dragged on for more than a year. Minsk demands a reduction in the price of gas while Russia seeks to make Belarus pay back their debt for previous deliveries, now amounting to $400 m. In order to encourage Minsk to pay, Moscow plans to reduce its supply of oil to Belarus by 12%, according to claims by Russian business newspaper Kommersant from 9 January. On 26 December, Uladzimir Andreichanka, the head of the lower chamber of the Belarusian parliament, stated in Moscow that 'the situation at the Belarusian-Russian border goes beyond the contractual framework and common sense.' In mid-September, the Kremlin closed its border with Belarus for third-country nationals without any prior notice – thus ruining Minsk's plans of becoming a transit country. Belarus's list of grievances is quite long: Belarusian officials periodically complain about Russia implementing protectionist measures, or that the Russian media and commentators are portraying Belarus in a bad light. On 22 December, the Belarusian Foreign Ministry even recalled a Russian diplomat to protest statements by the head of the Russian Strategic Research Institute questioning Belarusian sovereignty. If the present misunderstandings between the two countries were a reason to overthrow Lukashenka or occupy Belarus, the Kremlin would have already done so dozens of times, as the countries have already been through many similar conflicts. But despite all the animosity between Lukashenka and Putin, the Belarusian leader remains simply a difficult ally for the Kremlin – not an enemy. Even given the conflict in Ukraine, the Belarusian government is less pro-Ukrainian than it lets on. According to information published by Radio Liberty on 4 January, a Belarusian militant fighting against Ukraine in Donbass, who has killed dozens of Ukrainians, freely visits Belarus. The KGB has invited him for talks, but has not opened a criminal case. Previously, Belarusian KGB officials stated that they would prosecute Belarusians who join the fight in Ukraine, on either the Ukrainian or the Russian side. However, evidence shows that the Belarusian authorities remain reluctant to initiate criminal cases. Although Belarus's rejection of a Russian military base on its territory was certainly painful for the Kremlin, Belarus managed recover from the conflict by announcing the launch of an Integrated Regional Antiaircraft Defense System. Belarusian diplomats have repeatedly refused to support a UN resolution that would have condemned Russia's actions in Ukraine. Although the Belarusian authorities are making small steps towards promoting their own culture, which Russian nationalists seem so afraid of, Russian culture and media still dominate in Belarus. When Russian television broadcasts reports about a possible re-orientation of Belarus to the West, Belarusian authorities do not block them. Even the recent arrests of several Belarusophobic authors seem relatively insignificant compared to Kazakhstan, where the authorities have consistently been condemning pro-Russian activists for several years now. Neither does Belarus intend to undermine Eurasian economic integration, as Belarus needs this market to sell its own manufacture goods, while Western countries remain primarily interested in Belarusian petrol. Minsk is slowing down Eurasian integration to gain concessions from the Russian side, as the Belarusian economic system exists thanks to Russian energy 'subsidies'. This new iteration of the off and on Belarus-Russia conflict is hardly unique, albeit with one exception. Russia has started to count money and seems reluctant to give Belarus handouts, demanding more loyalty from Belarus. However, this is a far cry from replacing Lukashenka or occupying Belarus. Minsk views a normalisation of relations with the EU as being in its national interest. The Russian World cannot be a political factor in Belarus, according to the Metropolitan of the Belarusian Orthodox Church. The economic recession has reached its lowest point, and in 2018 the Belarusian economy will once a gain experience growth. Russian economic policies towards Belarus are creating obstacles for Eurasian integration. Several Belarusian IT entrepreneurs appeared in the '30 under 30' Forbes rating. The city of Hrodna sees a rise in the tourism sector as a result of the new visa-free regime. The government reduces the cost of visas to Belarus. All this and more in the new edition of the Belarus state press digest. Minsk seeks to build bridges between regional actors. Narodnaja Hazieta publishes an interview with Andrej Rusakovič, chairman of the Centre for Foreign Policy and Security Studies, on the dynamics of Belarus-EU relations in 2016. Consistent normalisation of relations with the EU is in the national interest of Belarus, as this enhances economic development and strengthens Belarus's global position. The fact that Belarus currently holds the Presidency in the Central European Initiative and the 2017 OSCE Parliamentary Session is to be held in Minsk means that the EU has recognised Belarus's achievements in shaping a stable and lasting security system in the region. Belarus's geopolitical position makes it dependent on EU-Russia relations. Therefore, Minsk seeks to build bridges between various European associations and institutions in spite of the historical, economic and cultural differences between the countries of the region. The Russian World cannot be a political factor in Belarus. Belarus Segodnia discusses the recent comments of Metropolitan Pavel of the Belarusian Orthodox Church and the arrest of several pro-Russian journalists. The Metropolitan spoke of the 'Russian World' not as a political factor, but as a cultural and spiritual space. The newspaper adds that today some adherents to this idea propagate the armed defence of all those who identify as Russian but live outside Russia. The author argues that this idea has no potential in Belarus, since people with Russian roots work everywhere in the country, ranging from road workers to the head of the Council of Ministers. The newspaper stresses that incitement of ethnic hatred is a crime, and the arrest of pro-Russian journalists should not be considered a restriction of free speech, as some media debates suggest. Economic recession hits bottom, 2018 will see growth. Respublika discusses the prospects for the Belarusian economy in 2017. In a recently published macroeconomics review, Sberbank of Russia noted that the economic recession in Belarus is grinding to a halt; this has been the case for three consecutive months now. According to a World Bank report, 2017 will still be uneasy for Belarus, but the worst of the recession has already passed and 2018 will see visible growth. The government points to the 11% inflation rate as its main success in 2016, and hopes to drive it below 10% in 2017. It foresees a 1.7% GDP growth for 2017. Major growth factors will include global oil prices and the state of economy of Russia, Belarus's dominant trade partner. A forecast of the Russian economy predicts zero growth, so Belarus can hardly expect anything better, the newspaper concludes. Russian economic policies towards Belarus create obstacles to Eurasian integration. Negotiations on supplies of Russian gas to Belarus lasted for almost a year, writes Narodnaja Hazieta. Back in spring, falling oil prices and a significant devaluation of the Russian ruble made Minsk claim $73 dollars per thousand cubic metres as a fair price for Russian gas. However, Russia continued to demand $132 and went on to cut oil supplies to Belarus to be extra persuasive, which immediately affected Belarusian budget revenues. Such behaviour contradicts the basic principles of the Eurasian Union, which promise equal prices and conditions for all members. A food safety conflict came as another serious blow to bilateral relations. At the moment, the Russian food control agency Rosselkhoznadzor has placed limits on exports from 20 Belarusian agricultural enterprises to the Russian market. The author concludes that a union does not make sense if it fails to meet the interests of all parties. Belarusian IT entrepreneurs appear in the Forbes '30 under 30' rating. Jaŭhien Nieŭhień and Siarhiej Hančar made it into the Forbes '30 under 30' ranking, which lists 600 of the brightest young entrepreneurs, breakout talents, and agents of change in 20 different sectors. The two Belarusian were included in the Consumer Technologies category, reports Belarus Segodnia. According to the magazine, 'When Facebook wanted to catch up with Snapchat, it turned to two entrepreneurs from Belarus. Nieŭhień and Hančar built MSQRD, an app which adds crazy filters to selfies. After the app caught on in the U.S., Facebook bought MSQRD for an undisclosed amount in March 2016. Since then, both co-founders have been working for Facebook in London'. The city of Hrodna sees a rise in the tourism sector thanks to the new visa-free regime. The visa-free regime in Hrodna Region has been in effect for two months now. Around 2,200 tourists have already taken advantage of the opportunity to visit Belarus over this period. In the end of 2016, the Hrodna City Executive Committee met to discuss what has already been done and how to attract more foreigners, writes Hrodzienskaja Praŭda. The recently created website www.grodnovisafree.by informs potential travellers about border crossing procedures and the tourist attractions in the region. The authorities have already installed signs on the boundaries of the visa-free zone and modified the working hours of museums, currency exchanges, and other tourist spots. They also drafted a schedule of events for 2017, which includes more than three hundred festivals, celebrations and other brand activities. Meanwhile, tourist companies and attractions are hurrying to translate their facilities into foreign languages and introduce wifi networks. The government reduces the cost of visas to Belarus. On 1 January 2017 Belarus introduced new consular fees for issuing visas, writes Belarus Segodnia. Now, individual visas will cost €60, regardless of the number of entries, while a group visa will cost only €10 per person. Previously, foreign visitors had to pay €150 for D-type visa, €120 for a multiple C visa, and €60 for a one-time visa. Citizens of Poland and Lithuania could acquire visas for half the price: €25 and €60 respectively. According to new regulations they will also enjoy lower rates than other countries, while citizens of Japan and Serbia will be completely exempt from consular fees.